I need something different, don’t you? The music is German, the dancers are Kazakh, the insanity transcends borders: The Optical Illusion Dance! I found another tarantula in my kitchen this morning. That ranks high on the list of ideas I never thought I’d ever have occasion to put into words. In fact, until recently it would have been a close contender for number one on that list, along with My unicorn is pregnant and No thanks; I’m tired of chocolate. Let’s just have a nice green salad for dessert. This might be a good place to mention the slugs. Slugs have been slithering out from wherever they were and sliming their way onto my kitchen counter. I have developed an excellent system for relocating them because I cannot bring myself to even think of cleaning up whatever might be left after throwing salt on them. Then of course, there are the teeny-tiny black hopping insects that jump on to me if I go and stand next to the front garden for more than a moment. Flealike, they are about half the size of period (full stop) in Times New Roman 11. (And I think that with that we can agree that I have established my geek cred.) They are the reason the grocery store called me today to verify that I had really asked for that many cans of bug spray in my online order. As I’ve written before, I am sure that creepy crawlies have their place in the order of created things – but that place is not in my house. Anyway, back to Chaetopelma olivaceum, the Israeli Black Tarantula, sometimes called C. gracile. The one I found this morning was relatively small, about a third the size of a grown one. That is terrifying. Terrifying! Why? Because it’s a baby. There is a mama around (unless I killed her earlier this month) and probably siblings. I don’t know how many eggs a mommy tarantula deposits into her egg sac and a Google search creeped me out before I found a definitive answer, but it looks like the minimum is fifty. So, yeah. Slugs aren’t looking so bad right at the moment. In my saner moments, I am sure that I don’t have fifty tarantulas in the house or garden because even with chemo brain, I’m pretty sure I’d have noticed. But still. Now, one thing that people who know me will tell you is that I’m kind of nuts about a clean house. Being unable to keep things up to my standards is an ongoing annoyance with my poor health. So last year’s cockroach invasion was as insulting as it was annoying. But all you have to do with cockroaches – even though the ones we have here are about the size of your thumb – is spray. Slugs require a bit more attention, in terms of relocating them. (Or cleaning up salty, goopy ex-slugs.) So I had planned to ask the Young Man who helps me around the house to pull out the washing machine from under the kitchen counter because I suspect the slugs are entering from behind it. Then we could plug the holes and pour kilos of salt behind the machine before putting it back. Finding a juvenile tarantula in my kitchen calls for a change in plan, however. 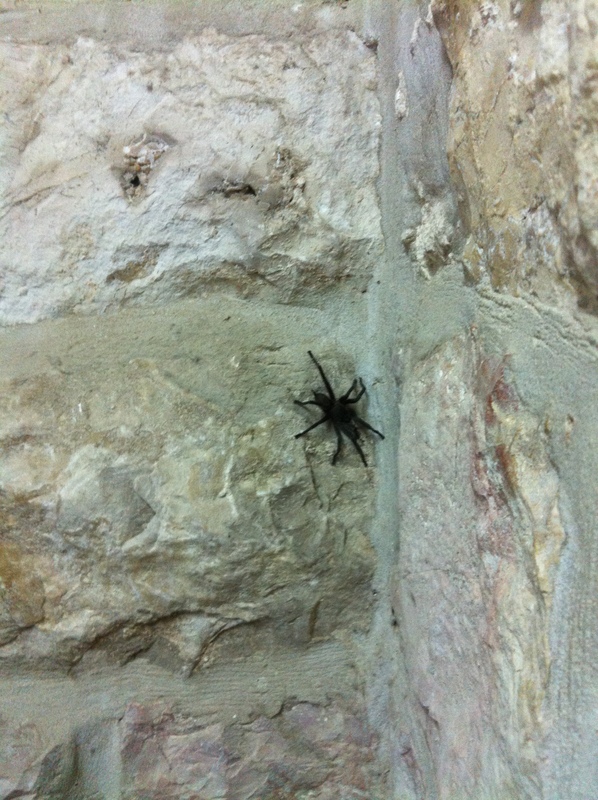 Slugs are gross, but Israeli black tarantulas are poisonous. And the idea of a nursery of them in some corner of my kitchen does not bear thinking about. So when the Young Man comes tomorrow we are going to empty out the kitchen cupboards v-e-r-y slowly and carefully and assess the situation. Then we’ll wash everything down with soap, water and bleach and spray poisonous chemicals in all the nooks and crannies. Or call in the military. One or the other. But right now I’m going to go take a long, hot shower because this is the itchiest post I have ever written. It’s that late night – early morning time, 3:45 to be exact. I wake up, as middle-aged ladies often do, to handle urgent business. I reach over my head to turn on the light, and my gaze follows the beam to see this. Compare to the light bulb for an idea of the size. This, my friends, is the Israeli Black Tarantula, Chaetopelma olivaceum previously known as C. gracile. I don’t know why the name was changed. I don’t care, either. Now, before we go any further, here are a couple of facts about C. olivaceum. First, and perhaps most salient to our purposes, most tarantulas around the world are not toxic to humans. Not so our furry little friend here. 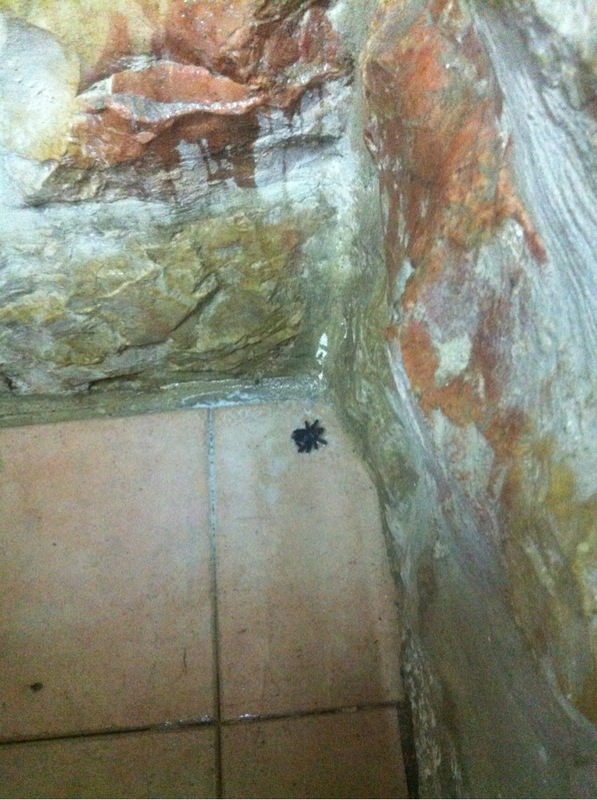 The Israeli Black Tarantula is indeed toxic to humans. The other interesting fact is that they have been known to jump. They are, as a friend dubbed them, ninja tarantulas. Okay then. Now that those little bits of information have sunk in, take another look at the photo. The lamp is fixed to the headboard of my bed. The headboard is where my pillows are. The pillows I put my head on. 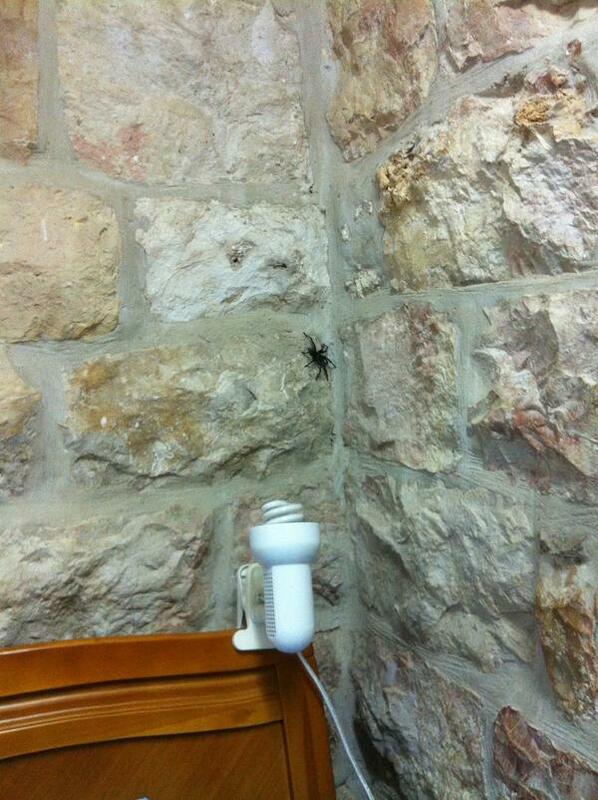 I had been sleeping with a poisonous, jumping, ninja tarantula an arm’s length from my face. Right. Now that we have that out of the way, let’s take a closer look at my little visitor, shall we? The salient fact of this part of our discussion is that I am nothing if not a child of my times. What is the first thing I did after leaping out of bed? I reached for my iPhone because, as we all know, pics or it didn’t happen. Yes, I even messed around with flash and ambient lighting to get the best possible shot. 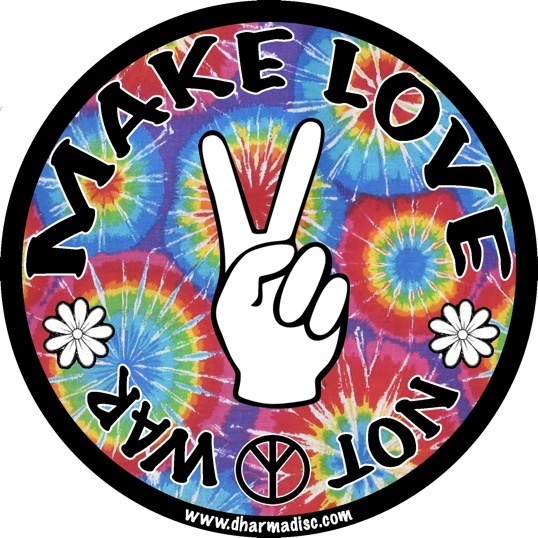 Let us draw the cloak of charity over all that, shall we? I am a Franciscan in my spirituality and in principle I praise the Creator for all of creation because “He saw that it was good”. I have to assume that in the larger scheme of things poisonous, jumping, ninja tarantulas have their place. Their place, however, is not inside my house. There being no man around to do the cardboard-and-shoebox thing, I went nuclear. That is, I got out the Raid. Auntie Wiki lists the creatures that Raid will “kill dead” and ninja tarantulas are not among them. So I got out the cockroach-strength (lasts for up to six months!) can from under the kitchen sink, opened every door and window in the house, and took careful aim from about a meter away. I sprayed and sprayed and sprayed. I had expected that good ol’ C. olivaceum would scuttle out of the line of fire, but instead she slowly stalked down the wall. I followed her with the spray. I felt like a commando. Half a can later, victory was mine. You were a worthy opponent, Taran. I honor you. Of course then I had to go stand outside for a long time because the air was no longer breathable in my house, but small price to pay. as performed by the Chad Mitchell Trio. The lyrics are there so you can sing along. Enjoy! Most of you have probably seen this one, but I always enjoy watching it again. For those whose Norwegian might be a little rusty, subtitles are provided by Norwegian Broadcasting (NRK), who originally broadcast the show. As I said yesterday, my birthday is sometime this week. I’m having a party and everyone is invited! And because it’s a virtual party we all get to dance like no one is watching!